James Harold Jennings lived in rural North Carolina. He was taught at home by his school-teacher mother . In addition to her instruction, he avidly read dictionaries, encyclopedias, Popular Mechanics issues, and National Geographic. These sources provided a diverse, if eccentric, education for the artist, traces of which can often be found in his art. Jennings worked for a short time on his family's tobacco farm. Later, he was a night watchman and movie projectionist, but he left that job in 1968 after his nerves "went bust". After the death of his mother in 1974 he began making colourful creations out of scrap wood and placed them around a group of five buses across the street from where he lived. His environment eventually included brightly coloured angels, animals, assemblages, whirlygigs and kinetic sculptures of all sorts. He eventually moved out of house and into the buses. He lived there without electricity and cut out his complex assemblages with a coping saw. 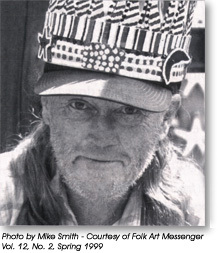 It has been said that "Jennings' work is a unique hybrid of Appalachian art traditions and a wide range of contemporary influences from such sources as comic books, tabloids and national geographic ... 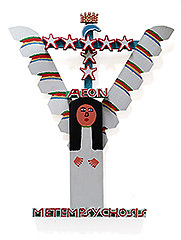 He had an uncanny mastery of artistic elements from many cultures ... His work is colorful and lighthearted; yet, symbolically engaging with a broad thematic range from mystical angels and totems to bold "Tough Girls"." Jennings work is in numerous permanent collections including those of the American Folk Art Museum and the American Visionary Art Museum. He committed suicide in 1999, apparently because of concern about his physical health and the doom and gloom that was being prophesied for Y2K.